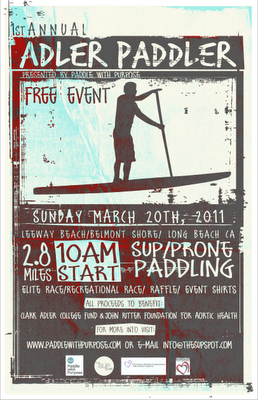 Stand Up Paddle Surfing: Adler Paddler Race, March 20th, Long Beach... I'm in- you? 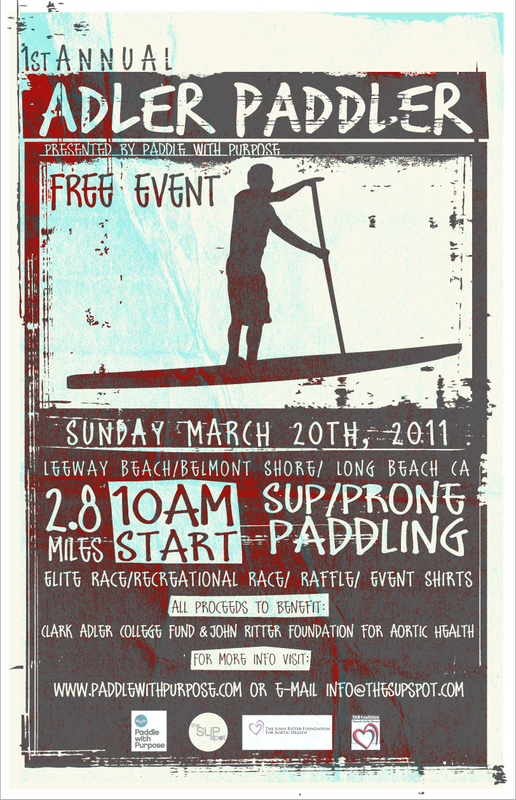 Adler Paddler Race, March 20th, Long Beach... I'm in- you? Save the date March 20th, 2011! Paddle With Purpose will be having its first event of 2011. A lot has happened over the past year and Paddle With Purpose has been fortunate enough to be in the process of becoming a stand alone non-profit organization!! We are in the process of being approved for non-profit status, establishing branding, getting the board of directors chosen, finalizing the mission statement, as well as creating a new website!!! We didn’t want to wait as we knew that one of the events we will have every year is the Annual ADLER PADDLER! This event will take place every March on or around St. Patrick’s Day. The purpose of the event is to Honor one of our dear friends Steve Adler who passed away suddenly last March from a genetic Ascending Aortic Aneurism. Steve loved the sport of stand up paddling and this will be a free event open for both experienced and novice paddlers, in hopes to get people out together enjoying this great sport. The other main purpose of this event will be to raise funds for Steve Adler’s son’s college fund through sales of event T-Shirts and an amazing raffle. We will also use this event as a platform to raise awareness and educate people about Ascending Aortic Aneurisms. So come on out for a fun or serious race around Naples island. Just under 3 miles. Bring down your paddle board, prone, or stand up, or borrow one from a friend. If you don’t have a board we will have a limited amount of boards and paddles to rent on site for a donation to the cause.